I’ve always loved food, both eating it and preparing it – and of course seeing others enjoy what I’ve made. And this enjoyment started at an early age. When most young boys were riding their bikes or playing with action men, I could be found helping my parents in the kitchen of their multi award-winning hotel in Devon. They were perfectionists and only let me wash up and peel potatoes at the start, but as my skill and attention to detail improved the guests were soon unknowingly eating breakfasts and starters prepared by a ten year-old! So the seeds were sown early – but the question I get asked most is why, out of all the foods available, did you choose to specialise in bread? I certainly didn’t start out thinking bread would be my future. After catering college I got a job working alongside one of my chef heroes – Pierre Koffmann – and I learned whatever I could in all sections of the kitchen. Today, few restaurants bake their own bread on the premises but back then Pierre was renowned for serving amazing bread to his customers. When his bread guy left quite suddenly I was asked to step in and help, and at the time I just saw this as a great opportunity to learn from the master – and another string to my culinary bow. I was 21 then and that guy leaving inadvertently put me on the path to where I am today, allowing me to discover and develop a true passion for bread. Nothing hits the senses quite like bread: the feel of dough in your hands as it changes in elasticity; the smell of the yeast; the sight of a golden crust cracking as the bread cools. Even after all these years I never tire of these things and still get excited knowing that essentially, with a lot of love and time, a bag of flour can be transformed into a wide range of beautiful smelling, delicious tasting bread. Seeing, smelling, feeling and tasting are all vital senses in the process of making great bread. An expert baker can feel when the dough is right and has been worked enough, can see when it has proved enough and smell when it is baked to perfection. But you probably don’t know that hearing is also important to the process. When you are mixing dough, it actually sings to you – and recognising that beautiful sound is key to knowing that the dough is properly hydrated and the gluten is being correctly worked. For me, bread felt instinctively right from the beginning. I did progress in my career and become head chef at Michelin-starred restaurants such as Chez Nico, but it was inevitable that after playing the field I would finally settle down with my perfect match – and one true food love. And it was definitely meant to be. 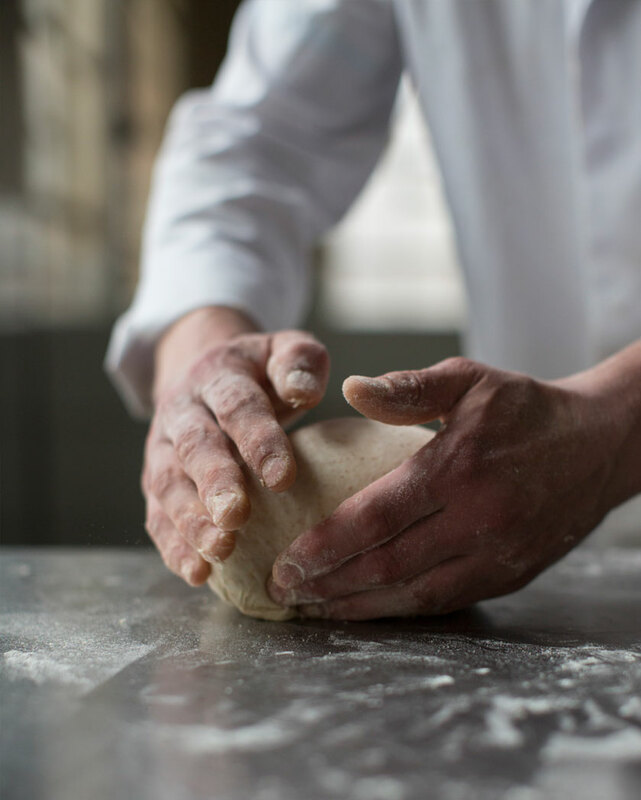 My passion for great bread is as strong as ever and despite running a business, I am still a chef who likes nothing better than to slow things down, get my hands covered in flour and focus on using all my senses to ensure every loaf is perfect. Why not put some time aside to see if you have a feeling for bread? While nothing can replace years of knowledge and that innate instinct, a simple white loaf is easy to make and only has four ingredients.